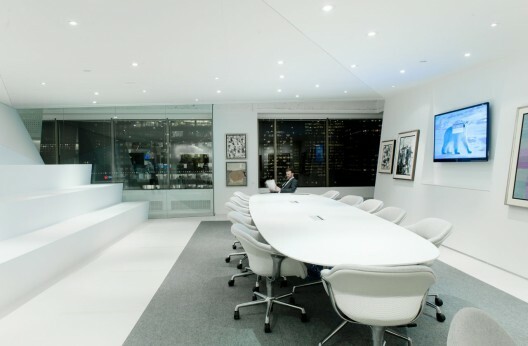 This office renovation involves tenant fit-up to the 19th floor of a downtown Toronto high-rise, home to the new corporate headquarters of Polar Securities, a successful Bay Street Hedge Fund and Investment firm. 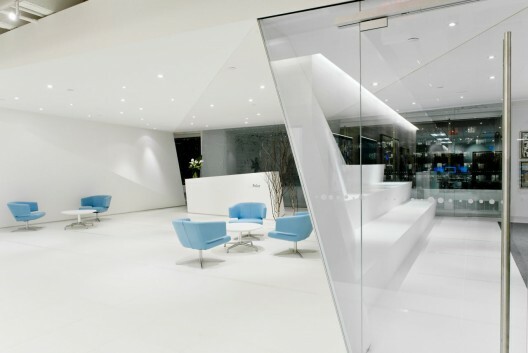 The project focuses on strengthening corporate identity, and creating the most desirable and functional work space to attract and retain the industry’s top talent. The design challenge centred on two main client objectives: to embody and amplify the company’s corporate identity, and to display the client’s large collection of Canadian Modern Art. 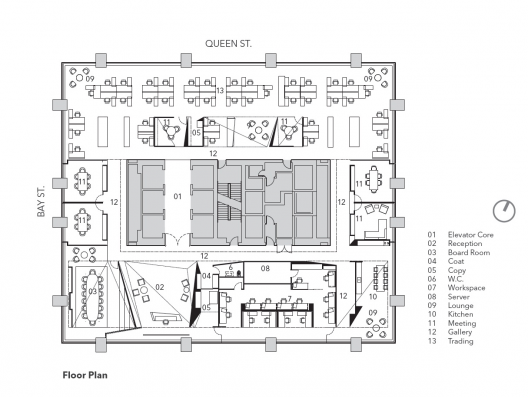 The design solution addresses these two unique requirements by way of distinct program zoning (Meet, Lounge, Work, and Gallery areas), which converse with one another through a play of material and surface. 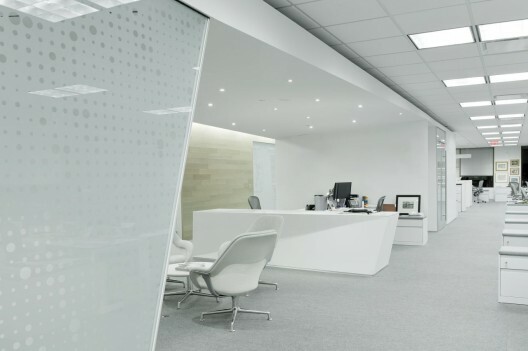 Polar’s identity is figuratively incorporated as Arctic imagery in the design: a fractured and minimal arctic landscape inspires the physical expression of the office, resulting in a white palette of sliced and folded planes reminiscent of breaking ice. The rooms are constructed as two pure rectangular objects, ‘solids’ subtractively divided and tessellated into fractured rooms of glass, white drywall and Corian planes. Tessellated ceiling planes invisibly incorporate acoustic stretch wall fabric systems. Cave and crevasse type spaces are formed to float over a boundless white ground plane. In contrast to the abstracted, Arctic-cool wall and ceiling planes, the Gallery space is defined by warmth and texture. Baked white Oak clads the building core; weathered, warm and worn, it identifies the Gallery space and defines public circulation throughout the office.